On October 7, LG Display declared to start mass production of the first flexible OLED (Organic Light Emitting Diode) panel to apply in mobile phone. Later on, people began to speculate that LG would release a smart phone with a flexible screen in November. On Oct. 9, Samsung announced to issue OLED flexible phone-Galaxy Round though Korean SK Telecom. 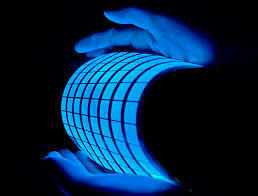 OLED is thin so it can be installed on materials like plastic or metal foil. It makes the screen lighter and more durable by plastic instead of glass (1320, 0.00, 0.00%). Journalists saw in LG Display factory located in Paju on Oct. 8 that the flexible OLED panel shapes like a concave from top to bottom with a 700mm flex radius. It is introduced that the product employs plastic baseboard but not the glass baseboard. The panel becomes flexible but will not break by film encapsulation technology and pasting protective film on the back. The flexible LG Display panel is only 0.44mm thick which is the thinnest among the global existing mobile terminal panel. In addition, the 6 inch screen merely weighs 7.2 gram and it is the lightest with the largest dimension among the current smart phone OLED screen. LG Display demonstrated the world’s first 55 inch flexible screen OLED TV panel during the 2013 Consumer Electronics Show. And this OLED TV panel has appeared and sold in many countries including China currently. In the fact, Samsung has also initiated sales of the similar products. But this kind of big screen TV is pretty expensive at the moment and the related design is commonly regarded as a marketing stunt. Except for the latest flexible OLED panel, LG Display mainly introduces Ultra High Definition large-sized screen used for TV in China. According to the data of DisplaySearch, the market scale of Ultra HD in China is 620,000 in 2013, taking up to the 62.8% of the world; The number will turn into 6 million by the 2017. It is known that LG display panel takes 30% share of market in China which is equivalent to its global share. SUN Yongjun said that the market shrank a little because of suspend of the Chinese government’s home appliance subsidy policy. But there is a trend of slight growth owing to the National Day in Quarter 3.